Building TS stand and outfeed!?!??!? 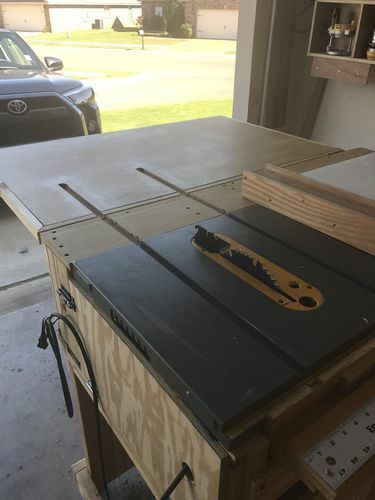 So it’s finally time, I have the DeWalt DWE7480 Table Saw and need to find a more permanent/functional set up than the desk I have it sitting on. I am wondering (hoping really) if someone has designed and built a mobile stand with out feed for this saw already? I have some ideas but I can admit that I am not the greatest at planning out the details or constructing formal working plans. I would like for this to be a nice functional and sturdy piece to the contractor saw. Any pointers or tips, if you’ve seen anyone offer plans or ideas are all greatly appreciated. You think I would have learned how to use Sketchup but I must be getting grumpy old man syndrome. I have no desire to learn another software program. I’m designing one now.. I’ve changed it a couple times since I started, I’ll post a photo of my “sketches” (I have downloaded sketchup but never used it).. I don’t know if this will help you or not, but coincidently I just posted a TS extension that I just completed. It’s different, but functional & sturdy. Perhaps the concept will help. By no means am I an expert but here are a couple of things I took into consideration on my own current TS build. Overall size LxWxH. 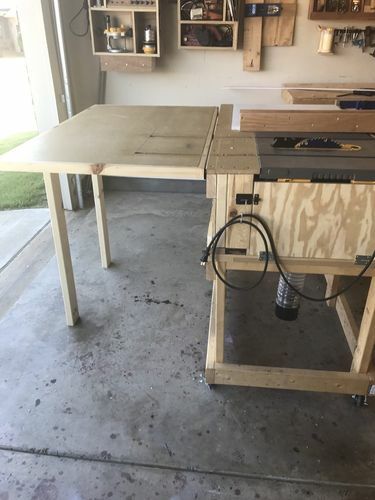 Once I got that down by measuring both tablesaws I went with a list of all the accessories that went with them and worked out where they went. Then on to jigs, router bits for the attached router table. (A possible upgrade to consider for yours?) Finally with all that sorted out I looked at what space was left and figured out what power tools would fit in the leftover space. 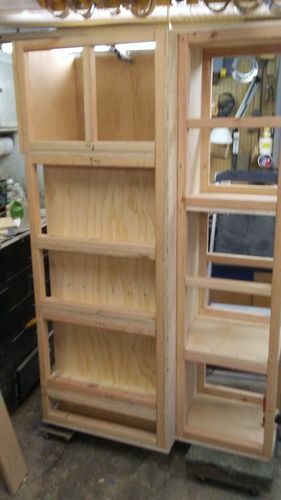 As my cabinet is 68 inches by 42 inches I went with a 1 1/2 inch angle iron frame and attached mobile base hardware with upgraded casters that hold 300lb each. Probably overkill but as Bearpaw will tell you that would be normal. I know dust collection is a big deal but the collection on my saw is fair at best. 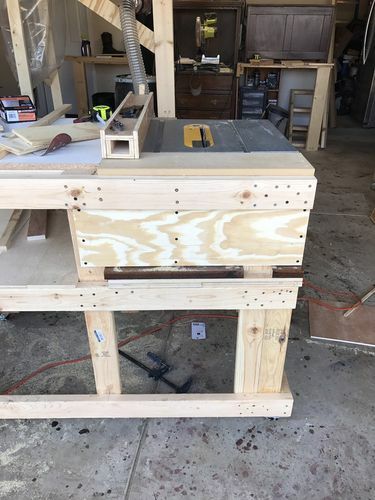 The actual saw cabinet (contractors saw) has a 10 inch square hole at the bottom. 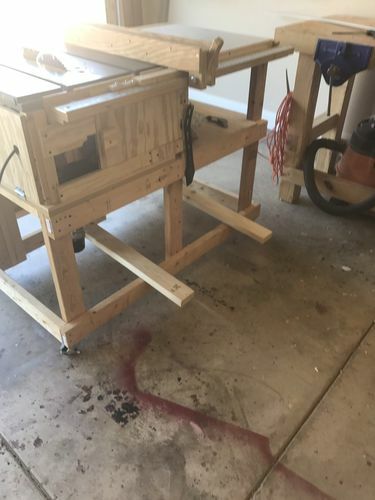 Years ago my Dad bought a bag to go under the saw that he never actually used. For mine to deal with clean out I put a drawer under that and empty as needed. With two saws this required two such drawers. Sorry all I have for pictures is the carcass standing on its end on dollies so I can work on it in the shop. Finished product is probably 3-4 months away. I have the same saw, and this is my set up. Let me know if you need specifics. Wood Magazine had a plan for one as part of their Idea Shop #5. Here is a link to it. Thank you gentlemen, there are some good suggestions here. I will probably wind up using a bit from each of your suggestions. 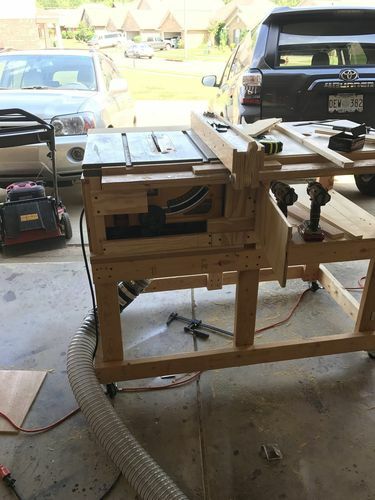 I do like the idea of adding my router table to use the same outfeed.